Having been gone for three years, closeted advertising executive Adrian returns to his Texas hometown for the holidays during the first wave of the AIDS crisis. Burdened with an unspeakable tragedy in New York City, Adrian looks to reconnect with his teen brother Andrew while navigating his relationship with religious parents Eileen and Dale. When he reaches out to his estranged childhood friend Carly, their unresolved issues force Adrian to confront an uncertain future that will significantly alter the lives of those around him. Shot on black and white super 16mm film, '1985' takes a unique look at a pivotal moment in American history through the prism of empathy, love and family. 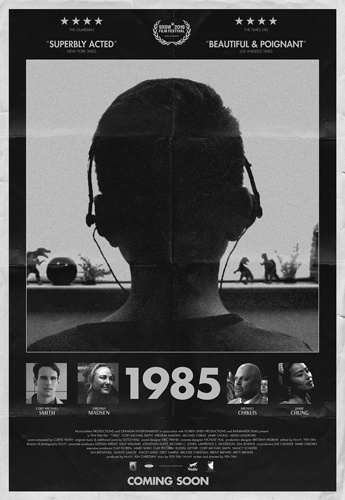 To celebrate the release of '1985' in cinemas, we're giving you the chance to win a double pass. Competition opens at 5pm AEST on Sunday 14th April 2019 and closes at 11:59pm AEST on Sunday 21st April 2019. Five winners will be chosen at random on Monday 22nd April 2019. To successfully win, entrants must fulfil the above entry conditions before the time the competition closes. Current members/followers are eligible to enter the competition. Only one entry per person. Only one winner per household. To be a valid winner, the entrant must not have won a prize from SWITCH within the last 28 days. Each winner will receive one double pass to '1985'. By entering, you agree to receive occasional emails from SWITCH in the future. If you decide to unsubscribe from these updates, any further entries will not be applicable. Only Australian residents are eligible to enter. '1985' is in cinemas from Thursday the 25th April 2019 through Icon.